If there’s one thing people love about weekends, it’s brunch. It seems like the popular brunch restaurants in every town have lines out the door every weekend! I usually don’t even try to go to crazy-busy restaurants for brunch on the weekends, but instead I make brunch at home. 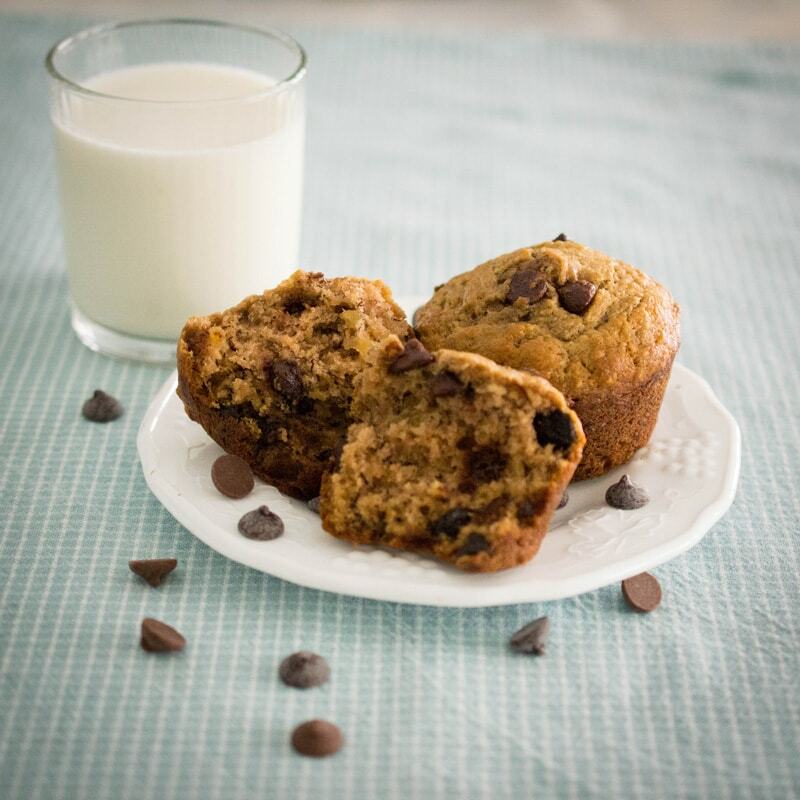 This recipe for chocolate chip banana muffins is one of my favorites. These muffins are soft, buttery, and full of chocolate chips. They’re a little bit decadent, to tell the truth. They remind me of the Jim Gaffigan joke: “A muffin is just a bald cupcake, and we all know it.” You could also say they’re healthy, though, because they’re made with simple ingredients like bananas, oatmeal and milk. I made these muffins recently when we had a TON of leftover fruit in the house. My daughter Abby was in charge of the grocery shopping while I was out of town, and she bought more fruit than we could eat. It happens to the best of us. We had so many overripe bananas, I made a TRIPLE batch of banana muffins. 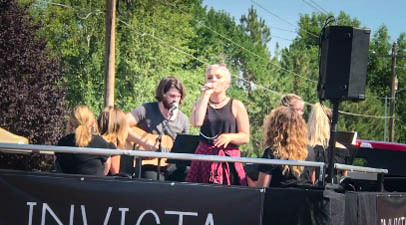 Of course, when the float passed by where we were sitting, it was not Abby’s turn to sing, so I literally ran after the float for 7 or 8 blocks, trying to get photos and videos of my daughter. Yes, I was that mom, running down the street, holding my iPhone in the air and looking ridiculous. 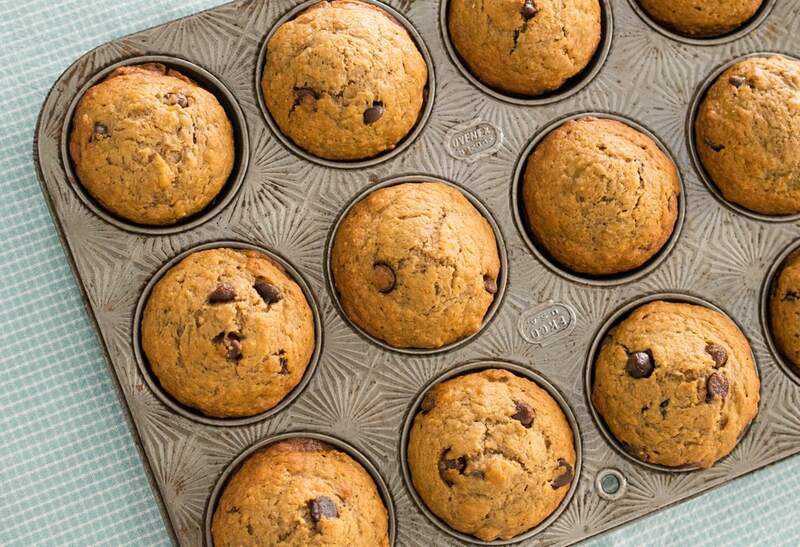 The process for making these chocolate chip banana muffins is simple. The muffins call for oat flour, which many people don’t have, but you can make your own by grinding oatmeal in a blender or food processor. Whatever amount of oat flour you need, use that amount of oatmeal. So for this recipe, you would use 1/2 cup of oatmeal to make 1/2 cup of oat flour. Next, mash 3 or 4 very ripe bananas (depending on size) to make 1 1/2 cups mashed bananas. Mash the bananas with a fork or potato masher until there are no lumps. Blend the bananas with white sugar, brown sugar, melted butter, and whole milk in a medium mixing bowl. In a separate bowl, mix the dry ingredients: all-purpose flour, oat flour, cocoa powder, baking soda, and salt. 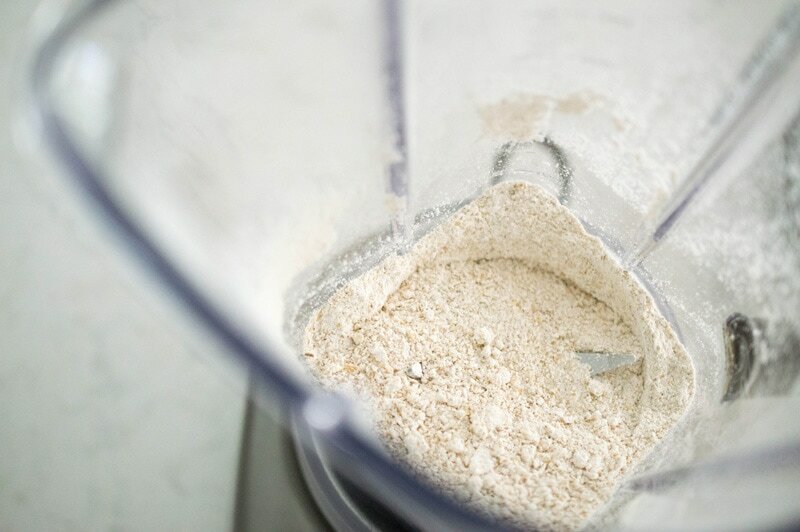 Combine the wet and dry ingredients, mixing as little as possible until all the ingredients are incorporated. Muffins will become tough if they are overmixed. The texture of this batter is like a very thick cake batter. It’s thicker than most cake batters, but still pourable. Fill the muffin cups 3/4 full. I fill mine to about 1/4 inch below the rim, and that creates a nice domed muffin. Bake the muffins for 16-20 minutes, or until the centers spring back when touched. You can also test muffins for doneness by inserting a wooden skewer or toothpick in the center. If batter clings to the skewer, bake them a little longer. These muffins have been one of our family’s favorite recipes for years. I’ve made a lot of them for my own family, for breakfast pot lucks, or for friends who were sick, had a baby or had surgery. They’re a perfect weekend treat. Give them a try, and share your comments below! 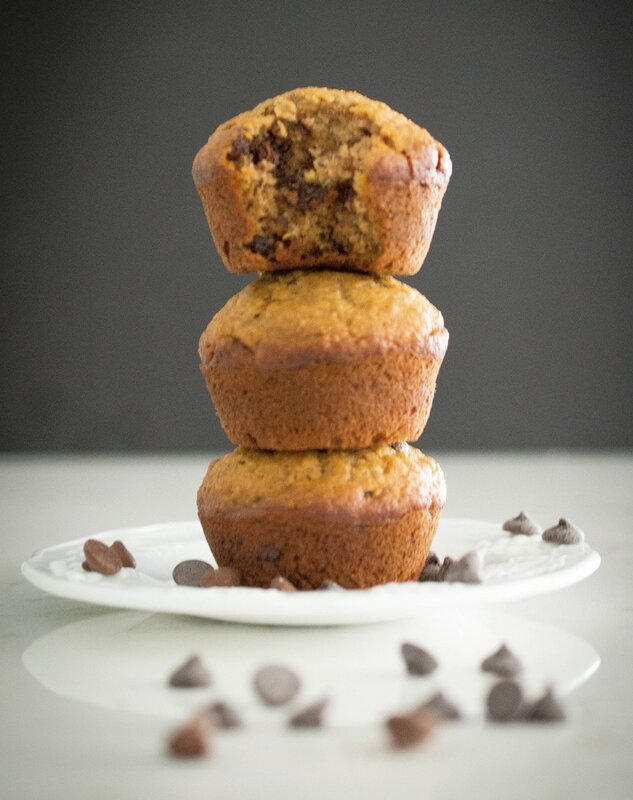 Perfect weekend banana muffins are soft, buttery and loaded with chocolate chips! 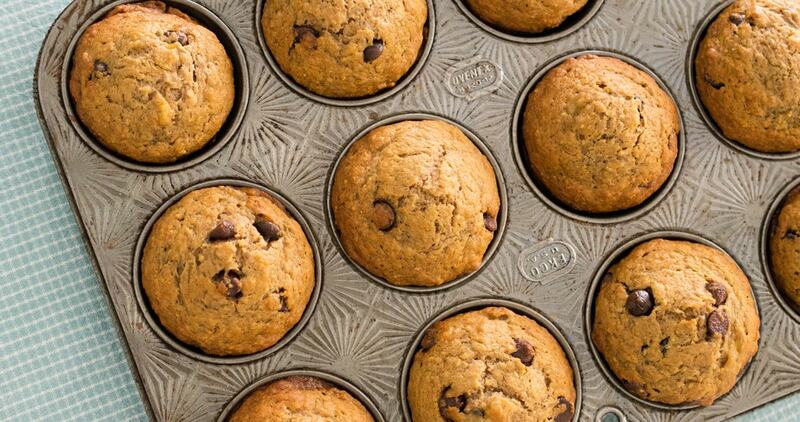 Spray a 12-cup muffin tin with cooking spray, or line with muffin cups. Preheat the oven to 350 degrees. 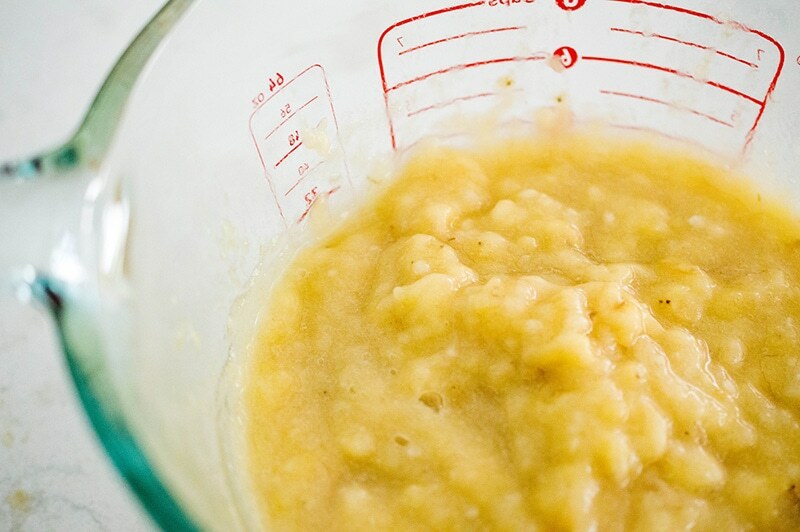 In a medium mixing bowl, mash the bananas with a potato masher or fork until no chunks remain. Mix with the sugars, melted butter, milk, and egg. In a separate medium bowl, mix together the all-purpose flour, oat flour, cocoa powder, baking soda and salt. Add the wet ingredients, and mix together with a wooden spoon or spatula. The batter will be the consistency of a very thick cake batter. If it is too thick, add 1 or 2 tablespoons more milk, or if too thin, add 1 or 2 tablespoons more flour. Mix only enough to incorporate the dry ingredients, and do not overmix. Fold in the chocolate chips. Fill the muffin cups about ¾ full. Bake for 15-18 minutes, or until cooked through and beginning to brown. Muffins are done if they spring back when you press lightly on the top with your finger, or if a wooden skewer inserted in the center comes out clean. Allow the muffins to cool for 10-15 minutes, then remove muffins from the pan and let them finish cooling on a cooling rack. Muffins taste best if eaten within 1 or 2 days, or keep in the freezer for longer storage.